A Rolls-Royce Trent 1000 engine, operated by Delta's joint venture partner Virgin Atlantic, was returned to service this month following a hospital shop visit in Delta's new state-of-the-art engine repair shop. The engine was the first to be inducted into the new shop in late 2018, where TechOps employees worked to repair the intermediate pressure compressor. Looking into 2019, the engine shop continues to take shape to help support Rolls-Royce with its hospital shop campaign visits on the intermediate pressure compressor, high pressure turbine and immediate pressure turbine modules. The engine shop will also be expanding its capabilities to include the Trent 7000. 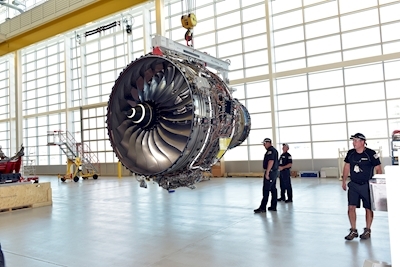 The new shop enables Delta to perform maintenance on engines with the most sophisticated and advanced technologies — in particular, the next-generation powerplants featured on Delta's Airbus A350s and forthcoming A330-900neo aircraft. Virgin Atlantic and Delta Air Lines started their partnership in 2014 and operate the leading transatlantic network between the UK and US. Virgin Atlantic offers travelers a choice of 39 trans-Atlantic flights a day to 26 nonstop destinations, and one-stop connections to over 200 U.S. destinations. Through its joint venture, Delta and Virgin Atlantic together flew over 5 million customers last year. As the largest aviation maintenance group in North America, Delta TechOps's highly skilled workforce of over 10,000 technicians, engineers and other support employees provide full-service maintenance to more than 850 Delta aircraft and their engines as well as maintenance services to more than 150 other operators, cargo operators and the military and government, through the airline's Maintenance Repair and Overhaul business.